In this book, Brian Castner not only retells the story of Mackenzie's epic voyages in vivid prose, he personally retraces his travels, battling exhaustion, exposure, mosquitoes, white-water rapids and the threat of bears. He transports readers to a world rarely glimpsed in the media, of tar sands, thawing permafrost, remote indigenous villages and, at the end, a wide-open Arctic Ocean that could become a far-northern Mississippi of barges and pipelines and oil money. What he reveals is a world that Alexander Mackenzie dreamed of but could never have fully imagined. Brian Castner is a former Explosive Ordnance Disposal officer who received a Bronze Star for his service in the Iraq War. He is the author of two books, The Long Walk (2012) and All the Ways We Kill and Die (2016), and the co-editor of the anthology The Road Ahead (2017). His journalism and essays have appeared in Esquire, Wired, Vice, the New York Times, the Washington Post, the Atlantic, and other publications. The Long Walk was adapted into an opera that has been performed at prestigious venues nationwide. "Discovering history, and not just new landscapes around the next bend in the river, is one of the delights of Disappointment River. And, during a time when so many American descendants of foreign extraction rail against immigration, it’s useful to recall that all of us originated in a diaspora." "...[Castner] provides a lively biography of Mackenzie, the youngest principal in the Northwest Company, contending not just with the rigors of exploration, but also with early corporate politics...A vital addition to the library of the far north and of exploration." "Vividly described, in well-wrought scenes that alternate from inspiring to humorous to stomach-clenching... Castner is a highly skilled writer and engaging companion." "Appealing on both historical and contemporary levels, Castner’s work will please readers fascinated by tales of discovery." 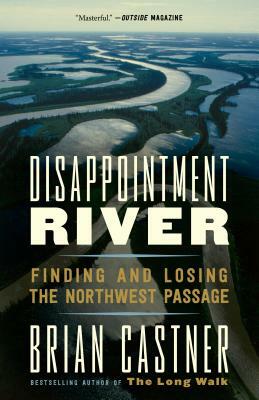 "...Intriguing and enlightening...For anyone concerned with the global effects of climate change, the meaning behind Disappointment River becomes alarmingly clear."